Hinges: Opening Your Church’s Doors to the Community. By Terry Tieman, David Born, and Dwight Marable. Cordova, TN: Transforming Congregations Network, TN, 2015. The authors should be commended for not simply lamenting the decline of the church in our time, but proposing a remedy. However, this begs the question: are churches truly not bringing the Good News of Jesus Christ to the lost? Though this can certainly be debated, their contention is that this is indeed the problem. The authors speak from a particular denominational affiliation, the Lutheran Church—Missouri Synod (LCMS), a conservative and confessional Lutheran church body known for its rich Reformation theology and robust Gospel proclamation. Unfortunately, recognition and integration of this rich theological tradition within the book appears anemic at best, if not altogether absent. More on that later. In short, the authors note a decline of the church with many congregations closing at an “alarming rate.” This, of course, is a current reality not unique to their LCMS church body; it is generally acknowledged across all denominational lines of North America. At the same time, they also say churches are figuratively closing their doors by being too inward focused and failing to bring people from the outside (unbelievers) in to their churches. What they propose as a solution is an alternative paradigm for being the church and organizing the church. Based on their research and analysis they have created metrics and tools for congregations to implement specific “hinges” that will make them more able and more willing to reach out to the surrounding community of unbelievers and thus be properly focused on “Christ’s Great Commission to reach those outside the church” (22). As I have noted elsewhere in my Great Commission, Great Confusion, or Great Confession: The Mission of the Holy Christian Church (Wipf & Stock, 2012), the emphasis upon the “Great Commission” as a mantra for the mission of the church is part of a more recent obsession over the last fifty years to demonstrate that the church has a clear mandate to be “missional” in nature and function. This has spawned a number of related but consecutive outreach movements—Church Growth, Emergent/Emerging Church, Missional, Contextualization—where each movement is really just a variation or perceived correction on the same theme of the original Church Growth Movement. Even so, the authors look to add their paradigm of “hinges” and “metrics” to the mix: “We have sought to know the key characteristics of churches that effectively empower church members to engage their communities with the Gospel. In other words, our research has focused on identifying the key factors, what we call Hinges, that shifted inwardly-focused congregations into churches that opened their doors to the community” (25). These “hinges” are identified and put into two “factors” categories—those of the pastor and those of the congregation. Four hinges pertain to the pastor: 1) Empowering God’s People, 2) Personal Leadership, 3) Visionary Leadership, and 4) Bridge-Building Leadership. Another four are identified for the congregation: 5) Community Outreach, 6) Focused Prayer, 7) Functional Board, and 8) Inspiring Worship. Assurances are given about how their research and metrics prove the effectiveness of these “hinges” for the greatest missional “impact” on the community: “The sophisticated processes that we have used have been guided by experts in this kind of statistical analysis. The results of the research conclusively indicate that there are eight behavioral drivers that will transform a plateaued or dying inwardly-focused church” (26). However, such assurances of transformation and growth mirrors the claims that first began the movement among evangelicals to commandeer the “Great Commission” as the official motto of the church some fifty years ago. Consider the promises of the “homogenous unit principle” of Donald MacGavran’s Understanding Church Growth (Eerdmans, 1970; 1980; 1990); Bill Hybel’s Becoming a Contagious Christian (Zondervan, 1994) and his noted “fifteen characteristics you’ll find in evangelistically effective churches” (200); or Rick Warren’s Purpose Driven Church (Zondervan, 1995) that promises “a Great Commitment to the Great Commandment and the Great Commission will grow a great church” (103). However, reservations and concerns over such confident assertions and approaches have become louder and louder. Among the many voices, consider evangelical Sky Jethani’s recent book Immeasurable: Reflections on the Soul of Ministry in the Age of Church Inc. (Moody Publishers, 2017), which expresses concern with what he calls “the idol of effectiveness.” He observes that the “Idol of Effectiveness has power because it causes us to look at the wrong fruit. We become enamored by relevance, power, impact, and how much we have changed the world. While all of those things are measures of effectiveness, none of them are a measure of faithfulness” (25). One wonders if faithfulness would be a plausible “hinge” for the church in this paradigm? What is more, even the secular world is now observing the danger of becoming too fascinated with metrics. In his just released book, The Tyranny of Metrics (Princeton University Press, 2018), Jerry Z. Muller brings to light what he calls a “metric fixation” (17) and the many ways in which numerical and statistical evaluations result in deleterious performance in our schools, our universities, our hospitals, our military, and our businesses. Other voices include Denny Spitters and Matthew Ellison in their recent book, When Everything is Missions (Pioneers, 2017), which calls the evangelical church to serious self-examination. They pose many thoughtful questions about the claims that “everyone is a missionary” and everything the church does is missions. They remind the evangelical church there is more to the life of a Christian than evangelism. “A life of repentance is central and vital to living the gospel each day of our lives. Our hearts and minds need cleansing and renewal for our understanding of the Great Commission to be brought to its rightful place. To think about missions well, we must embrace the illuminating wisdom of God’s word as our guide, submitting other books and teachings to be held accountable to the missiological guidance of the Bible” (114). Suffice it to say, these books reflect the significant concerns this reviewer has about Hinges. In the zeal to reorient the church to what is deemed as the sole mission of the church (reaching out to unbelievers), damaging consequences result from this paradigm and others like it. They include marginalizing the needs of faithful members (chief of which is the forgiveness of sins), reducing the church to a humanly created enterprise subject to the whims of metrics experts, and in the case of this book, negating the rich theological foundation that lies at the core of the authors’ own tradition. This criticism is by no means meant to denigrate the absolute importance and intentional effort that should be given to being a witness of Jesus Christ to all unbelievers, as well as regularly praying for them. Rather this is simply urging extreme caution when considering this paradigm because of the damaging consequences that are inflicted upon the church through it. Again, more about that in a moment. Before those specific concerns are unpacked, a couple of potential strengths are worth noting. The discussion about empowering God’s people is helpful, though ultimately misguided when it comes to the implicit theology undergirding for it. The authors clearly indicate what they mean about empowering people: “When we say empower God’s people we are referring to equipping people for works of service” (41). This has the potential to be a wonderful emphasis. However, this equipping is routinely unpacked and framed within the organizational life of the church, and for the specific and seemingly sole purpose of reaching out to the unchurched or lost. A tremendous opportunity is missed here. The rich Reformation theology of vocation (a vibrant part of the authors’ noted theological tradition) is never once mentioned. It would have been a great way to affirm the everyday life of God’s people in the midst of their daily God created vocations, and therein equip them to naturally and readily give witness within those daily vocations. Instead, the opportunity to affirm the First Article gift of daily vocations was replaced by the laborious organizational work of the numerous possible outreach events that they suggest a congregation should put on. The message is that the only service of value by God’s people is that which has a “missional impact” on the community. This message, however, overlooks and marginalizes the many important vocations every member of the church already possesses (family member, worker, congregation member, and citizen, as well as community member). What is more, one could venture to guess that the authors would never tell their adolescent children or grandchildren that they were going to leave or abandon them for the children of the community. Yet, in effect, that’s what they are suggesting the church and her pastors should do for the sake of unbelievers. For a tradition that cherishes the importance and central role of the forgiveness of sins in the daily life of every believer, there is little evidence of its role in this paradigm. Other potential highlights are their discussions of congregational governance board and leadership woes, along with the organizational dysfunction that often immobilizes congregational boards, as well as the importance of pastoral leadership. Chapters five, six, and nine discuss these issues respectively, though significant theological shortcomings are present in those discussions. Yet, in terms of positive contributions, the authors address the importance for pastors to continue learning, maintain healthy spiritual disciplines, and keep good personal health. They also bring out the legitimate point that pastors need to be familiar with leading the church forward as the local organization it is, preferably with a good sense and vision for what the congregation needs to be doing at the organizational level. Likewise, the authors also address the unhealthy and often unspoken assumptions that congregations have about their pastors and note how numerous congregational boards are unnecessarily charged with micro-managing the details of the staff and ministry in a way that limits the board being able to see the broader picture and free pastors to do the work they are called to do. As such, the discussions of congregational governance possibilities and solutions that can free the pastors for their work are helpful, though what the authors of this book limit that work to include (primarily only those things related to evangelism and outreach, with tasks like hospital visitation and pastoral care of souls being delegated to members) creates extreme disagreement for this reviewer. Finally, one last positive contribution is their treatment of the life cycles of congregations. Though one may disagree with some of the details of the life cycle, the general principle of life cycles and the diagrams showing them (86-87) are helpful for thinking strategically about ministry at a congregation. Now on to a collegial discussion of the remaining specific concerns about the book and the overall shortcomings of the Hinges paradigm. To begin, perhaps it would help to apply the metrics of a confessional Lutheran theological analysis to a paradigm that claims to originate within the tradition of the Lutheran Church—Missouri Synod. For example, how many times does this paradigm explicitly or implicitly draw upon the practical truths and theological principles as understood in the Lutheran Confessions? What research was conducted to contextualize the Hinges paradigm to orthodox Lutheran theology? What theological best practice was employed to create this approach to ministry? Would it be fair to say that such a paradigm doesn’t fit within a theological tradition if those questions were all negatively answered? Or would it be said that for the sake of the lost (unbelievers) churches must be willing to sacrifice their theological heritage? If so, why? Confessional Lutherans have a specific means to define the church and its mission. Lutherans hold that the forgiveness of sins earned by Christ for the justification of the sinner (AC IV), stand at the center of the mission of the church. And the marks of the church are identifiable when the Word of God (both law and gospel) is preached in its truth and purity and the sacraments are administered faithfully for the forgiveness of sins and the strengthening of faith (AC V). This confession takes seriously the relentless effects of sin upon every soul and recognizes the constant need for all people to regularly receive the cleansing grace and forgiveness of God in Christ Jesus. The Hinges paradigm reorients not only the definition of the church, but also the marks of the church. Rather than the church being “the assembly of saints in which the gospel is taught purely and the sacraments are administered rightly” (AC VII), where both members and outsiders alike could come to receive the means of grace, this paradigm organizes the local congregation entirely around the law. In the well-meaning but misguided effort to get inward churches to begin looking outward, the material principle of the Gospel (the shed blood of Jesus for the forgiveness of sins) is replaced by the Great Commission (Go! Evangelize, serve, and do whatever it takes to win the lost.) In essence, the law now becomes the organizing principle of the church. Here the marks of the church (Word and Sacrament) are likewise traded for the pragmatism of best practices and metrics of missional impact. This paradigm is one of many in the recent past that seek to reorient the Church, but which are all ultimately rooted in the law. Most certainly, the church should go about compassionately showing mercy, happily serving others, and vigorously giving witness to unbelievers. But from a confessional Lutheran perspective this is not the organizing material principle of the church. This corrective to inward-focused churches that the authors desire to provide is certainly understandable and commendable, but the remedy they propose breathes in a foreign theology that muddles the Gospel, marginalizes the work of faithful pastors and the vocations of members, and reduces the power of God to organizational metrics. The influence of this foreign theology appears, for example, in the advocacy of “prayer walking” (chapter 10) and “inspiring worship” (chapter 11). To be sure, Christians are free to pray anywhere, and walk anywhere, and even to pray while they walk. But the advent of focused “prayer walking” as a means to increasing the efficacy of prayer and claim a neighborhood for Christ has no biblical precedent or injunction, is of recent origin, demeans other prayers and those who pray elsewhere, and has plenty of unhelpful baggage—see Prayer Walking by Steve Hawthorne and Graham Kendrick (Creation House, 1993). Consider this quote from chapter 10: “All churches pray, but it’s prayer that is focused on the lost and unreached and equipping God’s people to connect with them that really makes a difference (144).” That is not what James 5:16 says actually makes a difference: “The prayer of a righteous person is powerful and effective” (NIV). Ironically, chapter 10 is the one chapter that does invoke the Lutheran Confessions, specifically Luther’s Small Catechism on the Lord’s Prayer, and does have some edifying things to say about prayer, but ultimately it turns prayer into another spoke in the wheel of the law-oriented paradigm of outreach. The rector maintained the point of view that the revival movement could well, and with more permanent gain, have stayed in the Church, and defended the place of baptism and confirmation in their relation to such awakenings among people. “Awakened people also have children, and when they are once brought into the world there remains the duty of nurturing them. We have had revivals before in these parts, and always it has gone badly for the children. Either the revival burns out with the older generation, or it becomes necessary to begin to reckon the children as Christians and nurture them with catechism and confirmation and all the churchly ministrations, as the Church has always done”(119; Augsburg, 2005). In the end, though this book has some helpful things to consider regarding the organizational elements of a congregation and the leadership of pastors, there are too many unhelpful things to be able to commend it to the confessional Lutheran tradition. For an alternative that looks to prize the rich Reformation theology of the Lutheran Church—Missouri Synod, keep the Gospel at the center, and provide a beginning framework to mobilize the church for intentional witness right where they are at in their daily vocations, you might consider the aforementioned Great Commission, Great Confusion, or Great Confession? The Mission of the Holy Christian Church. My aim in that book is the same as writing this review: to bring more light and less heat on matters central to the life of the church. In our confusing times we need more honest and open dialog through collegial conversation. The “solas” are at the forefront, appropriately so, of a lot of Reformation jubilee discussion and literature as October 31, 2017 approaches. Because they can be seen as providing a content-rich but extremely compact summary of the Reformation movement, Reformation teaching, or of the motivations of the Reformers, even the fact that they’re in Latin is overlooked. I myself find, as I pastor in a setting where Lutherans are one of the rarer breeds of Christianity, that a short reference to sola gratia,sola fide, and sola scriptura can go a long way, not only to describe who we are, but also to garner some respect among those who otherwise suspect me of having a shrine to Martin Luther in my house. Being Dad: Father as a Picture of God’s Grace. By Scott Keith. Irvine: NRP Books, 2015. Order here. Much ink has been spilled over the subject of Christian parenting, especially the vocation of “father.” The critique of modern Western society that the role of father has been degraded to the point that we no longer recognize the true purpose or value of having a father is more than accurate. Doubtless this is a contributing factor to the Western acceptance of the equivalence of mother and father or much worse the irrelevance of the father. Yet many recognize the need of some sort of father-like figure—certainly all the super-villains and heroes in the movies having “daddy issues” is no coincidence. So what is a father? Is he necessary? What does he look like? What does he do? Scott Keith, executive director of “1517 the Legacy Project,” adjunct professor of theology at Concordia University, Irvine, and (more relevant) husband and father of three children, brings the light of Scripture, the Lutheran Confessions, and even some anecdotal experience to these questions with the book Being Dad: Father as a Picture of God’s Grace. Rather than being a how-to manual on raising children as a man, Keith examines what the Scriptures tell us about being a father from the example given us in our heavenly Father. Keith’s stated purpose for the book: “This book . . . will draw a picture of a good father given as a gift by a good God in order to bring children, to bring little sinners, to Himself” (6). For this reason, Keith suggests, it is the father’s first God-given duty to bring the Gospel of the free forgiveness of sins to the children entrusted to his care. The emphasis throughout the entire book is that the father should be a theologian who properly distinguishes Law and Gospel in the home. Keith never suggests that the father ignore the Law and be a passive patron of cheap grace, rather Keith constructs the book to demonstrate that a father is a God-given picture of His divine grace. Keith’s first step is the ever-familiar parable of the prodigal son. He gives an in-depth study of the characters, motivations, and emotions involved in this parable. While Keith offers no novel ideas, he gives an absolutely necessary starting point for understanding the vocation of father: the benefactor and teacher of grace, and of children: receivers and witnesses of grace. At this point Keith discusses the necessity of manly men, or in his words “masculine fathers.” He attempts to discern from the dim mirror what a masculine man is like. Certainly being a real man is more than drinking beer, smoking, shooting guns, and eating red meat. Keith suggests—and I believe correctly—that a truly masculine man is not only capable of performing “manly tasks” (whatever those may be according to his vocation) but he is gracious and loving. Keith defines “loving” in the sense of the Greek virtue “philia” brotherly friendship and love, or what our confessions would call “the mutual conversation and consolation of the brethren” (SA III:IV). A masculine father demonstrates this virtue to his children and exposes them to it through his various interactions with them and others in the world. Yet here no exhaustive list of characteristics can be made for the masculine man, instead we simply accept the flesh and blood examples. It is no coincidence that God places great importance on the estate of marriage. This clearly is for the protection and good of both husband and wife, but also for the protection and raising up of children. For this reason, Keith devotes an entire chapter to the father fulfilling his vocation as husband. He discusses that the vocations of father and mother are neither equivalent nor opposite each other; rather father and mother complement each other. Keith devotes the rest of the book to discussing what it is to be a father, the “magic” and wonderment a father can and should bring into his children’s lives, what it means that the father is the “head of the household,” and finally what a healthy reliance of children on fathers looks like. Keith closes the book with helpful anecdotes from those in the vocation of father and/or child. He uses these to illustrate the single point successfully made throughout the entire book that the foremost duty of the father is to be a picture of our gracious, heavenly Father. “God provides fathers so that children can know His love in this denotative way. Fathers provide the opportunity for children to point at their dads and say, ‘God’s love is like that. Like him over there. Like my dad,’” (82). Keith’s book is a welcome and necessary contribution to the ongoing discussion on the necessity and qualities of that thing we call “fatherhood.” In this book, he hits on the necessary points to show from Scripture and experience how the father is an absolutely necessary God-given vocation in this life. Brand Luther: 1517, Printing, and the Making of the Reformation by Andrew Pettegree (Penguin: New York, 2015), 338 pgs. The flood of words in books and articles, on blogs, and at conferences commemorating, discussing, and making hay of 1517 is already here. One of the insights of Andrew Pettegree’s new book on Luther and the media of his day is that this flood is nothing new. The German printing market boomed in the first quarter of the sixteenth century in large part thanks to Luther’s very modern ability to write about theology in clear, brief, and convincing vernacular language, and fortunes were made printing and publishing in the German world where each printer could without hindrance reprint the Luther texts from Wittenberg he knew would sell by the hundreds and thousands. Pettegree marshals a very detailed knowledge of that particular story into line with the larger stories of the Reformation and Luther’s life and career. Pettegree does not write for the specialist. He uses the word “Reformation” with a capital R and without any discussion of a variety of “reformations,” including a Catholic one. Although the book covers the period from roughly 1480 to 1580, the word “confessionalization” does not appear once even when he is talking about the clarification of confession and political status at events like the Diet of Speyer in 1529 or the publication of the Book of Concord in 1580. Commendably, he wants to make the outline of the history of the Reformation, the biography of Luther, and the role of printing in both comprehensible to someone neither pursuing a degree in or making a living from the subject. The narrative heart of the book is the biography of Luther, traced from his father’s investment in copper mines to his death at Eisleben seeking to reconcile feuding brothers. Someone without much or any very clear knowledge of Luther’s life story will gain it from this book. Into the bargain, Pettegree draws Luther without enlisting him as the herald or hero of something much larger than himself. Pettegree’s Luther is not the harbinger of modern freedom of conscience, the German nation, or even of all the Lutheranism that followed him. He was a man of singularly great intellect and facility of expression who was courageously tenacious or foolishly obtuse, depending on one’s sympathies. He was mighty at Worms in defending a conscience captive to the Word of God, uniquely instrumental in the history of the German nation and the German language, and the theological progenitor of what Pettegree calls a new way of being a Christian community instantly recognizable to modern Lutherans in its devotion to Scripture and the primacy of congregational song. Yet Pettegree is careful never to make Luther merely the sum of everything or everyone he influenced, a cipher we fill in for ourselves in commemoration of the great man. This is most clear when Pettegree narrates Luther’s two major absences from Wittenberg between 1517 and his death in 1546—his friendly imprisonments at the Wartburg in 1521-22 and at Coburg Castle in 1530. It was during those times that we have the clearest picture of how much Luther was involved in from day to day as he wrote and agonized about all he could not control. He gave detailed instructions to his wife Katie in 1530 about how a manuscript should be yanked from one printer and given to another, even as the first printer sent a beautiful final copy of the book to him, arriving after Luther’s excoriating instructions were already en route home. As he wrote at a superhuman pace in 1520-22 and managed and reviewed everything from university curricula to the placement of pastors in rural Saxon parishes to numerous manuscripts at divers and sundry printers all at once, Luther’s energy is astounding and his very human frustrations and dislikes evident. The “brand” the title identifies is the distinctive appearance of Luther’s writings that the reformer promoted after early mishaps with Rhau-Grunenberg, the only printer in Wittenberg when Luther arrived there. There were six other centers of printing in the German world: Leipzig in nearby ducal Saxony with its own university, Augsburg, Nuremberg, Basel, Cologne, and Strasbourg. Wittenberg’s sole printer was terribly backward by comparison, and once the thirty-four-year-old, hitherto obscure professor of Bible began to make a sensation with the publication of the Ninety-Five Theses, which were quickly reprinted throughout the German world, Luther knew that Wittenberg needed a sophisticated, modern look for its German-language Flugschriften, the very brief, very pungent writings so popular across Germany, and for its academic works in Latin and eventually for the German Bible, issued in parts from the September Testament of 1522 to the first complete Bible printed by Hans Lufft in 1534. With the aid of Lucas Cranach and the Lotter printing family, Luther put together a “look” for even the smallest pamphlets that would make his name and Wittenberg’s name sufficiently famous for both “Luther” and “Wittenberg” to be used on writings that were not strictly his and certainly had not been printed in Wittenberg. A specialist in the history of books, especially printed books, Pettegree is at his most detailed when laying out the nature of early modern printing and why, for instance, a Leipzig printer with Catholic convictions would petition his staunchly Catholic ruler for the right to print Luther’s works for sale in his staunchly Catholic territory. The interconnection of Luther with the emerging print media of his time is so necessary to understanding his success in view of his early obscurity and later ignominy, and Pettegree demonstrates the interdependence of the writer and his market masterfully. In connection with that central story of Luther and his use of what were then new media in ways before unused by any theologian, Pettegree deftly adds a general sense of the flow of the Reformation (including the humanists like Erasmus and Pirckheimer initially sympathetic to it), political and theological opposition to it (including a very sympathetic portrait of John Eck), and its eventual theological diversity, introducing at least briefly everyone from the more famous Zwingli, Bucer, and Calvin to the less famous but important Rhegius, Zell, and Müntzer. He is eloquent obviously on the role of printing and its suppression in markets more highly regulated than Germany’s, like France, England, or the Low Countries, where the suppression of early print media meant the suppression of nascent Lutheran sympathies. In a few paragraphs or a few pages, he covers topics as various as Zwingli’s progression from parish priest to his battlefield death, the relationship between Duke George of Saxony and Jerome Emser, and the southwestern German origins of the Bundschuh cause leading to the Peasants’ War of 1525. He is able to discuss all of this without becoming pondersome or superficial. There is much to enjoy here, not least the detailed maps of Luther’s world and well-chosen illustrations of major figures. There is much Pettegree says that is characteristically concise and precise that we cannot here discuss. Amid a flood already begun and perhaps now itself 500 years old of Lutheriana, this new book can retell the story you may already know with accuracy and fresh facts and insights and tell a newer story about Luther’s relationship to media fruitful for reflection on our own time of massive changes in how people come to see what they see and know what they know and finally to believe what they believe. Luther Reed: The Legacy of a Gentleman and a Churchman by Philip H. Pfatteicher (Minneapolis: Lutheran University Press), 2015. The shock of the past is how utterly unlike our own time it is. The shock of the recent past is how quickly it became so unlike our own. This brief biography of Luther D. Reed by the liturgical scholar Philip Pfatteicher is an exercise in justification, an attempt to provide a fresh analysis of Reed’s relevance for the present day. It succeeds in this but not because the line between today and Reed’s day is straight and highly visible. Reed was born a few years after the Civil War to a parish pastor in suburban Philadelphia and spent his entire life in Pennsylvania. His brief trips of liturgical and artistic reconnaissance in Europe are the exceptions that prove the rule. His father’s parishes included several stops in suburban Philadelphia, the upper Susquehanna Valley, and in Lancaster, where Reed took his BA and MA at Franklin and Marshall College. He attended the Mount Airy Seminary and served two parishes near Pittsburgh for a total of ten years before being recalled to Mount Airy in 1906 to oversee the building and operation of Krauth Memorial Library, named for C.P. Krauth, the founding father of the General Council and the Seminary to which Reed devoted the great majority of his life. This Eastern Lutheran world was German by descent but English in language and American in outlook. It was 150 years old when Reed was born and intimately connected to the country from before its founding. By Reed’s birth it was so devoted to the thought and life of the past that it had outstripped its own fathers in that devotion. Krauth had repudiated the theology of the seminary at Gettysburg at which his father had taught. Reed and other proponents of the Common Service would promote and promulgate a liturgical service and standard hitherto unseen in the United States. In his pastorate and in his writing and activity throughout his life Reed represented well the spirit of recovery and renaissance in doctrine and especially worship that was in the General Council and at Mount Airy from their founding. This spirit may rightly be criticized as “romantic,” a term Tappert used for Reed, but in its intense desire to bring the best of the past into the present, it often succeeded, changing American Lutheran liturgy decisively and in the chapel overseen by Reed, modeling that change for the church. It was the world that then was, and from the postbellum era down to the early 1960s it prevailed. Reed was a large part of that, building up the library at Philadelphia with funds from an incredibly generous layman he had known in Pittsburgh, enriching the worship life of the Seminary and promoting that richness for his students over a half-century, guiding the Seminary after the sudden death of its scholarly light, C.M. Jacobs. All of these duties came as surprises to the self-deprecating Reed. There is much to appreciate and to revisit in this slim volume: the rise of liturgical interests among American Lutheran pastors, the churchmanship Reed exhibited in his tireless service, the broad artistic tastes he had and cultivated in his students. The best part of the book, though, is Reed’s rebuttal of Theodore Tappert’s 1964 History of the Philadelphia Seminary. Pfatteicher includes Tappert’s acerbic summation of Reed’s life and works and then gives the reader the entirety of Reed’s nine-page, semi-public response to Tappert. It is a marvel of cutting wit, but it is above all a ninety-one-year-old man’s justification of his deeds. Reed believes Tappert was scholarly to the exclusion of churchmanship, perfunctory in the liturgy to the destruction of the Seminary’s chapel services, focused on books to the detriment of humans. He cites the fathers, Krauth, H.E. Jacobs, Schmauk, and many other earlier lights, as those who hoped in the future of confessional English-language American Lutheranism. Reed senses that his part was to carry on that legacy of renewal into his day of work and the realms of liturgy, hymnody, and church architecture. As you read, you can feel that world slipping away. He had outlived his world. That is no justification of Tappert’s malevolence. It is a recognition that by Reed’s death in the early 1970s, the world outside and inside the church had changed so drastically as to be unrecognizable. The change was a deluge, not a development. The reader is surprised to learn that Service Book and Hymnal in 1955 was Reed’s second major hymnal on which he had worked and was in its time the longed-for appearing of Muhlenberg’s fabled “one book” that would bring about the one Lutheran church body in America so many then wished to see. One is surprised because the book to which Pfatteicher contributed so much, 1978’s Lutheran Book of Worship, is now thought to have been that book, and it itself is now obsolete even in the church bodies that used it, not to speak of those that never did. Reed promoted the Common Service, now almost forgotten in the successors to his own church body, and with LCA President Franklin Clark Fry vastly preferred Jacobean English to all others. These are all liturgical reflections of an Eastern Lutheranism that then ordained only men, officially communed only Lutheran Christians, and celebrated the Divine Service only according to a few different musical settings of the Common Service of 1888. When one lives almost a century, he is sure to see change, but Reed lived to see a new world. Yet he was not a Columbus, nor do his books remain valuable because they herald changes to come. One can still read The Lutheran Liturgy or Worship for the same reason one might read Krauth’s The Conservative Reformation or Jacobs’ dogmatics. They are valuable in themselves and historically as witnesses to a world and a seminary and a tradition of churchmanship now gone, though buildings and names remain for now. He was the last man of the world that then was, parts of which survive in unexpected places. If he isn’t Columbus, he may be Montezuma. The Common Service is still used in American Lutheranism, but not by his direct heirs. Krauth and Schmauk are still read by some, but perhaps not so much anymore inside Krauth Memorial Library. This book is valuable to know the world before the deluge, especially if it is not your particular ancestral strain of American Lutheranism. It is also valuable to see what may be recovered from the past, as Krauth and Jacobs and Beale Schmucker and in his own way Luther Reed did in their day. 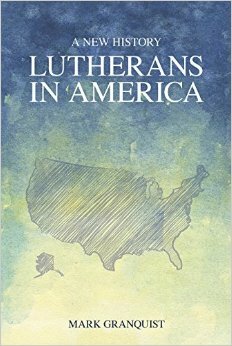 Lutherans in America: A New History. By Mark Granquist. Minneapolis: Fortress Press, 2015. At long last there is a successor to The Lutherans in North America, edited by E. Clifford Nelson and first published when Gerald Ford was our president. Comparison between the Nelson volume and Mark Granquist’s new history of the Lutheran churches in America is difficult because the former had a stable of authors, each contributing on his period of expertise. There was an unevenness going from Theodore Tappert to some of the lesser lights. Now Granquist tells the story himself, so the strengths and weaknesses are at least equal throughout. The comparison is not between apples and oranges but between different kinds of apples. They have much in common but finally are not meant to taste exactly the same. Granquist frames the story of American Lutheranism as a history of who came to America and when, who came into fellowship with whom and when, and how the faithful dealt with the innumerable changes America constantly brings. Granquist offers with the greatest possible precision tables and charts tracking Lutheran population, membership figures, and the various church foundations, mergers, and splits throughout all the years since Rasmus Jensen, the Danish pastor, was the first Lutheran minister to serve and to die in the New World. Anyone interested in telling this story will have to touch on common themes and figures. The derelict pastor Jacob Fabricius appears in colonial New York and then on the Delaware. Muhlenberg arrives in 1742 from Halle by way of London to set things in order and establish the first American Lutheran synod in 1748. In him the worlds of German Lutheran Pietism and British America meet: he is sent by the Halle Fathers with the urging and benediction of Michael Ziegenhagen, Lutheran chaplain to the Hanoverian English court. The Missouri Synod is established and grows extremely rapidly in the nineteenth century, even as Eastern Lutherans differ widely about what it means to be Lutheran. In the twentieth century Lutheran union eventually becomes almost everyone’s spoken or unspoken goal, and in a certain skepticism about the ultimate value of merger Granquist makes a very valuable contribution to Lutheran historiography. This pessimism about merger is the child of the disappointing story of the ELCA. Readers learn that the Commission for a New Lutheran Church (CNLC), established in 1982 to bring the American Lutheran Church, the Lutheran Church in America, and the American Evangelical Lutheran Church together, bequeathed all of its own tensions to the ELCA, when the new church came into existence in 1988. Strife over the doctrine of the ministry, the nature of ecumenism, the role of quotas in church governance, and the nature of human sexuality were all present on the CNLC, and so have been with the ELCA from its founding. Since 1988 it has in some measure declined in membership each year, and as early as the mid-1990s a task force on human sexuality drew up a report commending the ordination of actively homosexual candidates for the ministry. This report was hastily withdrawn when prematurely leaked to the St. Louis Post-Dispatch. To go deeper into the past, Granquist even observes that the bureaucratic difficulties of streamlining various groups into one and financially sustaining the one new church were present even in the ALC and LCA, although they had formed more than twenty-five years before the ELCA’s birth. He sees the difficulties experienced by the ELCA, the fruit of the hopes of so many Lutherans throughout American history, as endemic to any church body seeking to be nationwide and multiethnic in America. The General Synod, established in 1820, experienced theological dissension almost immediately, despite the relatively much greater homogeneity of the church body and the nation in the Era of Good Feelings. It even was the cause of a church split before its founding, when the Tennessee Synod formed as an exodus from the North Carolina Synod in opposition to a potentially nationwide church body. How much more, then, will there be dissension and variation in church bodies today that span across the United States and throughout the numerous social classes and ethnic groups America contains? With a much appreciated lack of noticeable rancor toward the Missouri Synod and other Synodical Conference church bodies, Granquist points out the growing theological heterogeneity of the LCMS in the 1950s and 1960s, in part explaining it by the great demographic changes coming to the Synod with an influx of non-Lutheran, non-Germanic adult converts as the LCMS spread out into the growing suburbs of postwar America. At the very same time lifelong Missourians pursued theological degrees outside of the Synod in large numbers, so that in both church and academe Missouri was less separate than ever. Missouri then began to face the same challenges of integration and Americanization that the General Synod had debated back when the Ministerium of Pennsylvania withdrew to preserve its German heritage. All American Lutherans struggle with almost all the same social, political, and economic challenges, but their different histories lie in how they respond in their preaching and teaching. It’s in that crisis of confession and theological discernment that one wishes Granquist presented a more theological view of theology. Words drawn from diplomacy crowd out theological words, so that a controversy over confessional subscription or the election of grace is often described in terms of “balance,” “moderates,” “the extreme,” as if everything is finally political. If the church’s history has anything to do with the calling, gathering, enlightening, and sanctifying of the whole Christian church by the Holy Spirit, then a church historian has to make theological judgments. At any given time someone made a true confession and someone did not; if that is not the case, then church historians awash in relativism are of all theologians most to be pitied. Granquist rightly notes that S.S. Schmucker was more Lutheran than his immediate predecessors in early America, but he is fuzzier on the exact differences between the General Synod and the General Council. It makes it hard for the student to see what all the fuss was about. The Missouri Synod is described in relation to seventeenth-century Lutheran orthodoxy, rather than particularly stringent adherence to the Lutheran confessions. This makes it hard to see why the LCMS objected to the General Council’s Akron-Galesburg Rule, since everyone claimed to be Lutheran. This lack of theological precision makes the old ULCA’s offer of fellowship to any church claiming to be Lutheran seem reasonable and even logical, whereas Missouri and much of Midwestern Lutheranism saw it as the acceptance of error. Granquist points out succinctly and brilliantly that where nineteenth-century Lutherans presumed the Bible’s authority and clashed over the Confessions’ authority, twentieth-century Lutherans simply clashed over the Bible’s authority. Full-blown Protestant liberalism came late to American Lutheranism, and his suggestion that what he and Maria Erling have called the Lutheran Left, devoted to social and political progressivism as well as theological liberalism, rose to prominence only with the formation of the ELCA is fascinating but undeveloped. Even in the 1920s Charles M. Jacobs’ promotion of Erlangen theology at the Philadelphia seminary provided a way for American Lutherans to differentiate between the Word of God and Scripture. Much work remains to be done on both the Lutheran Left and the rise of biblical criticism in American Lutheranism, without which we have a lot of trouble explaining the events of the twentieth and twenty-first centuries in both the LCMS and the ELCA and her predecessor bodies. If the world is impossible to escape, then every Lutheran church will face the challenges and opportunities it offers. Nothing will ever stay exactly the same, for better or worse. We all became or are even now still becoming Americans. The question at the end of reading this very valuable book is how an American can be a confessional Lutheran. All sorts of answers have been offered to that question, but one should pay particular attention to the Synodical Conference, which alone of any large church body did not pursue an organic union of its various constituent parts. While requiring a stringent confessional standard and actual teaching and practice in accord with that standard, the Synodical Conference contained the Midwestern and partly Eastern Germans of the LCMS (eventually with its annexed English District and the Finns of the old Finnish Evangelical Lutheran Church of America), the Midwestern Germans of what became the Wisconsin Synod, the Norwegians of the old Norwegian Synod and then the ELS, the Slovaks of the SELC, and in the LCMS what was by far American Lutheranism’s largest contingent of African-Americans. This is greater geographic and ethnic diversity than almost any other nationwide Lutheran confessional group, with perhaps greater doctrinal and practical unity than anything preceding or succeeding it. It could be that the organic merger and bureaucratic efficiency so long sought missed the point; that one hymnal, one seminary, or one church body cannot contain the linguistic, ethnic, and regional variety of American Lutherans. Yet unity might be found again as it has been found in the past: in a clear and unanimous confession. Bultmann is inevitable. He was the theological progenitor of many and the bête-noire of still more. Knowledge of his writings is indispensable for understanding twentieth-century exegesis, whether of the synoptic gospels, John, or Paul. His seminar students included everyone from Ernst Käsemann to Hannah Arendt. He was the sometime friend and constant interlocutor of Heidegger and of Barth. Although a confessional Lutheran may bemoan this fact, he is one of the previous century’s most important theologians. From the Review: "Pless is faithful to Luther’s theology of preaching and pastoral care of the terrified soul. This little book is essential for every pastor because it is nothing if not practical for a variety of pastoral needs. . . . This book will make you a better theologian and a better preacher because it draws you closer to Luther, the Confession, and our Lord Christ Himself as you study Holy Scripture." By any benchmark Hermann Sasse was one of the foremost twentieth-century Lutheran theologians. He incisively analyzed how modern trends in church life eclipse doctrinal truth.